Horse Training – How Much Time Does it Take? I am soon to be 57 and started the horse thing 3 yrs ago due to I had lived in the city all my life. I now live in the country with only 1 1/2 acer’s and 2 horse’s. I work full time and I am a sissy with the extreme cold or heat. I need incourgement with training. Whats the least amount of time I need to spend with horse in order to get results and how many months should I look forward to the results. I am looking to get closer to the 2 I have and really get them to trust me so I will feel safer on them. I have round bin now and am looking at some of the Perrelli DVD’s to learn. I just got bucketed off my 10 yr old walker last wk on to my head and she has never done that or kicked at me. But we were near home and she heard the other marer and I think she just wanted to go back–I let her put her head down which I no better but just not enough experence. What can you tell me that would help me. First of all, congratulations on your move to the country to make your dream come true of owning a horse ! As far as how much time? Even professional horse trainers will tell you that it takes a lot of time to get a horse to the point where the horse is confident and solid in his desirable responses. In fact, a common answer to “How long will it take…..? ?” is often “Take the time it takes.” In other words, you have to measure your horse handling, training and riding by results rather than a clock or a calendar. Your horse will tell you each day what you need to work on and when it is time to move on to something new. Start with something simple like catching and haltering. If that goes smoothly, then you can move on to some other ground work or tacking up and riding. But if the catching and haltering has some issues such as avoidance, high headedness, being distracted by other horses, invasion of your personal space or other such things, you need to iron those things out first before you move on. Specifically in regards to your letter, the horse you were riding was exhibiting barn sour, herd bound, or buddy bound behavior. As you know from landing on your head, you need to work on that first and foremost. There are a number of articles on that topic on my Horse Information Roundup. In addition, my latest book What Every Horse Should Know discusses the importance of developing Respect, Patience, and Partnership and NO FEAR of People, Things, Restriction or Restraint. Is Our Rearing Horse a Lost Cause? We bought an 8 yr old mare in June for our daughter to show in 4-H. She is a beautiful animal, but has a very dangerous problem. She shows well in showmanship and pleasure, but when trying to use her for patterned work (i.e. horsemanship or reining) she rears, and will even go over backwards, when asked to lope down the center of the arena. We have taken her to a local trainer, and he said he can’t “fix” the problem. She is fine along the rail, but she seems to rebel when it comes to working in the center at a lope. Can you please advise me as to whether she is a “lost cause”, or is there something I can do to master this issue? I wouldn’t say your rearing horse is a lost cause, but I would say that a rearing horse is a candidate for the most experienced of horse handlers. Just the phrase “will even go over backwards” strikes the fear in the heart of any instructor or parent. I’m just picturing it happening with your 4-H daughter astride. It simply isn’t worth the risk. I’m hesitant to give you any advice to help you work on this because I don’t know the severity of the problem nor your abilities and it sounds like the trainer you have access to is at a loss for how to proceed. What I would do if the horse were here would be to start with square one on ground training to identify the spot where the horse loses confidence and has a hole in her training. Then I would take the time it takes to work the horse through her issues, which would certainly take weeks and more likely months or even years to completely eliminate the horse’s tendency to rear as avoidance. Then once the horse was solidly over her rearing, your daughter would need supervised instruction on riding the horse so as not to undo what had been done. Therefore, I must defer to the position that since your daughter’s safety is at stake, she should not ride the horse. Nor should you for that matter. For the horse’s sake, if you can find a competent trainer that is accustomed to working with horses with such problems and you are willing to spend the time and money it will take to have the horse rehabilitated, then that is route you should take. If that is not an option, then retire the mare to pasture and find your daughter a more suitable mount. You might also want to read Looking for the Root of the Rearing Problem and other articles on my website. I’m sure that is not what you wanted to hear but all it takes is knowing one person who has been on the bottom of the pile when a horse has flipped over backwards for me to advise you to take extreme caution. It is great that you have a quiet and willing horse and even better that you want to keep her that way. There is no reason why your mare won’t stay calm and sweet as you progressively shorter her stride and slow her down a bit. This is a very common goal and a question I’ve answered before on my website Horsekeeping, so I’m going to use those Q&As below here. Let me know if you have more specific questions. My horse is usually really good, but a few days ago he just started being really stubborn. He’ll trot way too fast because I ask him for a jog for western pleasure. And his lope which I finally got down perfect 2 weeks ago has turned into a fast canter. I don’t know what it is from. There has been a lot more flies etc. around that go on him and he hates bugs so do you think that maybe this is causing it? Do you think he might not be able to concentrate because he’s thinking about all the flies on him or something? I’m really confused and I have to go to a show this weekend and if he does this there we for sure won’t place!!! Please give me any suggestions that you have. I’m going to ask a lot of things quickly at first here so you can go through a list in your mind and so that other readers with the same problem (it is VERY common!) can try to find a reason for the quickness. This first one won’t pertain to you because in your question, you say “he” so I am assuming your horse is a gelding. However, for those of you riding mares, be aware that a sudden quickness or irritability during breeding season (April to October) could be caused by the mare coming into heat. Heat periods usually last about 5 days. If you have a fussy mare, try to work through it or give her a day or two off during her worst days. Now for some questions that will pertain to any horse. Are you using fly spray? Do you check your horse’s chest and the area of the belly just ahead of your horse’s sheath (geldings) or udder (mares) where the skin is very thin and a feast for flies? Flies biting in these places can make a horse very tense while he is being ridden. Could your horse’s back be sore? A poor fitting saddle, dirty pad or cinch or a weak back can all contribute to a horse moving short and quick rather than long and flowing. Are you tense? If a rider is tense or nervous (in anticipation of a show, for example) the horse will pick this up right away and start moving quickly. You need to take a deep breath, settle deep into the saddle and relax. Here’s a technique tip. When you want to slow down or “rate” your horse, that is shorten his stride or slow down his tempo, accomplish it with a series of half halts or “checks” applied at the moment of suspension. During the canter or lope, suspension comes right after the leading foreleg lands and the hind legs are reaching forward under the horse’s belly. 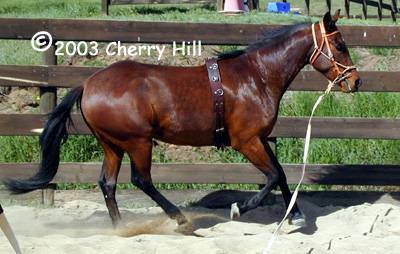 At the trot or jog, suspension occurs twice during each stride as each diagonal pair lifts. A half halt or check is a momentary “calling to attention” and just like the name implies, it is about half a halt! You want to reorganize your horse by briefly applying your aids for a halt but releasing them before the horse actually halts. When applying a series of half halts or checks to rate a horse, be sure you release after each successful reaction. Do not be tempted to hold on to what you gain and think you can slow a horse down by constant pressure on the reins. What you eventually want to do is have your horse learn to hold a gait at a certain tempo “on the honor system” (dressage riders call this self-carriage) – that is, on his own without you holding his speed down via the reins. Please help. I ride western. I am a professional Cowboy trying to become a horseman. I barrel race. I do not show. 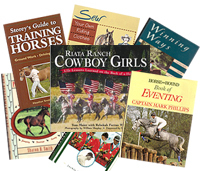 I purchased your 101 Arena Exercises to help me help my horses to relax, listen, loosen up, help them learn to use themselves and become more responsive I am not familiar with the term half halt and can’t seem to find a helpful definition in the book. My best guess was that it was a transition to a slower gait but in looking at the exercises this does not make sense to me. I know you are awfully busy but I’m feeling a bit desperate. For the sake of Reuben, Foxy, Sister, Miss Mess, and Hooch, Please help. It is great to hear from you and to hear of your goals. Have you read Exercise 14 “Half Halt or Check” in 101 Arena Exercises? It describes in detail what a Half Halt (or Check as it is called in Western riding) is and how to apply it. But it is such a good question and I’m sure there are some readers out there who don’t have 101 Arena Exercises, that I’m going to print an excerpt from that book below. Before I get to the excerpt, though, here are some other ways to think of a Half Halt……a pause, a moment in suspended animation, a compacting of form, flexing in every joint. Although half halts are traditionally associated with dressage, they are used in all kinds of riding. Western riders “pick up” on the reins and “check” their horses to “rate” them or get them to slow down or get more rhythmic in their gaits. When a horse “falls on his forehand” he is traveling with bad balance and rhythm, so we try to energize him from the hindquarters forward and elevate his forehand somewhat so he can move in balance. 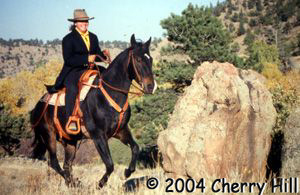 When a horse is not in balance (heavy on the forehand) he first has to pick up his forehand and then turn.The more in balance a horse is, the quicker he can change directions (especially important for a barrel horse) and at a moment’s notice – he doesn’t need a lot of advance notice. 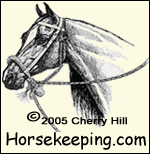 Half Halts or checks help to balance and energize a horse. 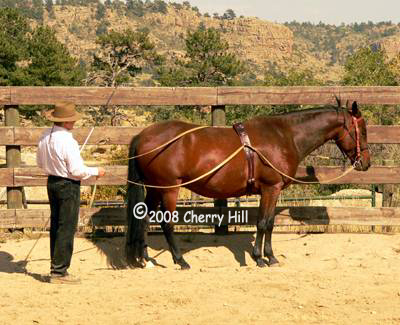 A half halt is a preparatory set of aids that simultaneously drives and checks the horse. In essence you are “capturing” your horse momentarily between the aids. A calling to attention and organizer used before all transitions and during all movements as a means of momentarily re-balancing the horse, elevating the forehand, increasing hindquarter engagement, evening an erratic rhythm, slowing a pace, and reminding the horse not to lean on the bit or rush. A momentary holding (a non-allowing in contrast to a pulling or taking), immediately followed by a yielding (within one stride or a few seconds). This results in a moment of energized suspension with a listening and light horse. Once a horse has learned to respect half halts, they serve as a reminder that encourages self-carriage. Upper body straight or slightly back with elevated sternum. Deep, still contact of seat bones on saddle from flexed abdominals and a flattened lower back which brings seat bones forward. Both lower legs on horse’s side at the girth or cinch. Light tap with the whip or spurs if necessary, depending on the horse’s level and response. A non-allowing of appropriate intensity with both hands. The following is a list in increasing intensity of that non-allowing. Use only as much as necessary. 3. Yield aids without throwing away what you have gained. When do you apply the half halt? Long enough (a second or two) ahead of the transition or maneuver to allow the horse to respond but not prolonged (through several strides) or it will result in tension. How strong a half halt should you use? Tinker Bell or Industrial Strength? Occasionally an industrial strength half halt is necessary to be sure it “goes through”. After using a major half-halt, confidently use light ones or half halts will begin to lose their effect for you. Often you should give more than you take. The timing of the yield is often more important than the driving and non-allowing. Did you feel a positive response…even a hint of compliance? If you wait so long that you can feel the full effects of the half halt, it would be way past time to yield. The yield is what encourages self-carriage. No yield leads to stiffness and tension. Should you use more than one half halt at a time? Sometimes it takes a series, one each stride, to accomplish the necessary re-balancing. BENEFIT Balance, collection, essential pieces of the riding puzzle. If you are going to use a bit when training your horse, the logical choice would be a snaffle bit. Alternatives to using a bit are bitless bridles, bosals, sidepulls, halters and tackless. These topics will be discussed in future posts. A snaffle is a mechanically simple bit that allows you to communicate with your horse in simple terms. A snaffle bit transmits pressure in a direct line from your hands on the reins to the rings and mouthpiece of the bit to the horse’s mouth. On a snaffle, there are no shanks. Shanks are the vertical sidepieces on a curb bit to which the reins attach. Shanks create leverage action. The snaffle bit operates via direct pressure only. The mouthpiece of a snaffle can be jointed or solid. The misconception that any bit with a jointed (or “broken”) mouthpiece is a snaffle has given rise to the misnomers: “long-shanked snaffle”, “tom-thumb snaffle”, and “cowboy snaffle”. All of these are really jointed (or broken mouth) curbs. The most common snaffle, the jointed O-ring, has four parts: two rings and a mouthpiece comprised of two arms. 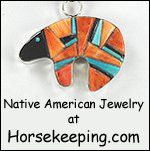 A snaffle is customarily used with a brow band headstall that has a throatlatch. Often a noseband is used with a snaffle. Snaffle Action The snaffle is useful for teaching a horse to bend his neck and throatlatch laterally so that he can be turned in both directions. It is also useful for teaching a horse to flex vertically in the lower jaw, at the poll, and at the neck muscles just in front of the withers. Vertical flexion is necessary for gait and speed control as well as for stopping. The bars are the flesh-covered portions of the lower jawbone between the incisors and the molars. This is where the bit lies. It is the action of the snaffle bit on the bars of the horse’s mouth that produces vertical flexion. With a regularly configured snaffle, when one rein is pulled out to the side, let’s say the right, the bit will slide slightly through the mouth to the right and the primary pressure will be exerted by the ring on the left side of the horse’s face. This will cause him to bend laterally and turn right. When the right line is pulled backward, pressure will be exerted on the right side of the horse’s tongue, the right lower lip, the right corner of the mouth, the right side of the bars and on the left side of the horse’s face. This will tend to cause the horse to bend laterally and begin to flex vertically so he shifts his weight rearward as he turns right. When you pull backward on both lines, pressure will be applied to both corners of the mouth and across the entire tongue and the bit may contact the bars and the lower lips. This causes a horse to flex vertically, shift his weight rearward, slow down, or stop. Your hands have the capacity to turn the mildest bit into an instrument of abuse or the most severe bit into a delicate tool of communication. Above all, good horsemanship is the key to a horse’s acceptance of the bridle. The introduction of the bit and bridle occur during ground training such as longeing and ground driving.